Take a whirlwind tour of the Mediterranean on January 24 when Ubisoft releases the Mediterranean Traveller Map Pack for Assassin's Creed: Revelations, featuring three brand-new killing floors and a handful of Brotherhood leftovers. Slated for release on January 24, the Mediterranean Traveller Map Pack gives Assassin's Creed multiplayer fans a chance to romp through the holy city of Jerusalem, the imperial district of Constantinople, and the colorful Dyers mercantile district, jumping out from behind things and stabbing other people dead as they go, which is pretty much how I expect the tourist trade worked back then. Show up in a foreign country with a Hawaiian shirt and a camera and you were begging to be shivved by a creepy doctor. 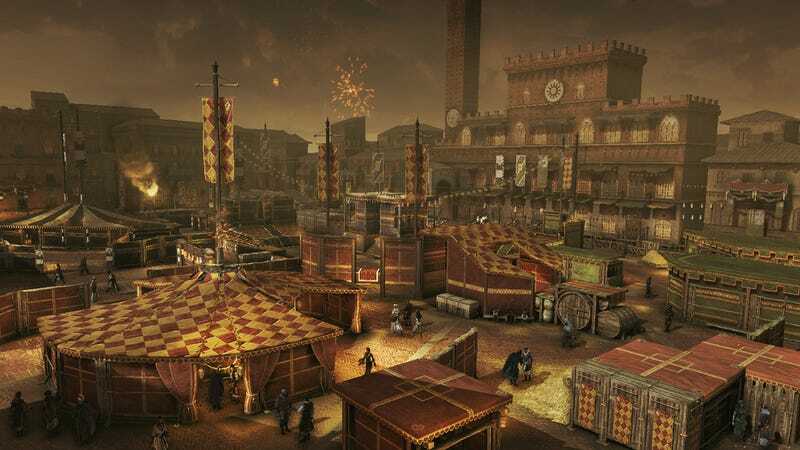 Along with the brand new sights and sounds, the pack also includes the Firenze, San Donato, and Siena maps from Assassin's Creed: Brotherhood, which I fondly remember as "those places I kept cursing at until the round was over". All six new maps will be available on January 24 for the Xbox 360, PC, and PlayStation 3. Euro prices are set at 800 Microsoft Points and £7.99, so adjust accordingly.